I can’t weep. I can’t fear. I’ve grown talented at pretending. Unique. 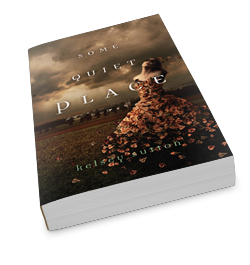 That’s the word I keep coming back to whenever I think of Some Quiet Place. Kelsey Sutton has created a gorgeously unique world in which feelings and elements are personified. It’s a little fey and a little something other. It’s bewitching and terrifying and captivating all at once. The story itself is beautifully stark. It’s gritty. It’s violent. It’s a bit ugly and disturbing in places, and for a story about a girl who is unable to feel any emotions, it’s surprisingly moving and poignant. Fifteen years ago, a car accident became the catalyst for Elizabeth’s emotionless state and and marked the unraveling of her home life. Her dad became an angry drunk, her mother – a target of her father’s abuse – became bitter and purposefully distant, and her brother tries to be as absent from home as possible. Elizabeth’s emotional void doesn’t allow her to feel the sting of rejection, the fear, anger, despair, or shame of being abused, doesn’t feel loss, loneliness, love, hope, courage, regret. She doesn’t feel anything. But instead of feeling robotic (which was one of my fears going into Some Quiet Place) her clinical appraisal of her circumstances, her emulating emotions so that she could pretend to be “normal,” evoked a myriad of emotions from me as I reacted to the situations in which she found herself. I find myself very impressed with how skillfully Sutton handled Elizabeth’s void of feeling and how she was able to emotionally connect me to a character such as Elizabeth. Some large part of it, I’m sure, had to do with (yes, her recent very vivid dreams, but also…) the wonderful cast of characters surrounding Elizabeth, and their perspectives of her, of her behavior and of life in general. Particularly the ones who took an interest in her or cared for her – Joshua, Maggie, Fear. Oh, Fear. Let’s talk about him, shall we? All of the other emotions have long since given up hope of provoking the tiniest bit of emotion from Elizabeth, and still Fear persists. He refuses to believe that she’s completely devoid of emotion, and is almost obsessively driven to solve the puzzle that is Elizabeth Caldwell. The relationship (if you can call it that) between Fear and Elizabeth is utterly fascinating. I wouldn’t call it friendship or romance, though it contains elements of both. I’m not sure what I would call it, actually. Elizabeth’s the only human who doesn’t fear him. The only human who isn’t terrified of his touch, and this intrigues him and captivates him. She’s almost an obsession, but… it goes deeper than that. It’s dysfunctional and slightly disturbing, but it’s also kind of twistedly sweet as Fear doesn’t give up trying to figure out the “Why” of why Elizabeth is the way she is and what makes her tick. However, as the personification of the emotion he’s named for, Fear tries to do this using his particular skill set on Elizabeth in rather horrific ways… hence the disturbing part. Like I said, it’s a fascinating dynamic and it’s easily my favorite aspect of this novel. You just have to read it for yourself. Speaking of “whys” and puzzles, I loved the mystery of this novel. The dreams Elizabeth begins to have, the strange things she begins to notice, the things that begin to niggle away at her nothingness, the constant wondering about Fear’s endgame – it all makes for a compelling story. It’s paced pretty well, with tensions and dangers continually rising, toward a conclusion that’s satisfying and, like I mentioned in the beginning, unique. Overall. Moving, edgy, and different, Some Quiet Place proves to be a deliciously dark mystery.